Public support for legalizing marijuana use is at an all-time high of 54%, according to Pew Research polling. This interactive explores events that have taken place over the last 45 years and the states’ legal actions on marijuana use. Americans' views on the legalization of marijuana have ebbed and flowed over the past four decades. Click through the points in the interactive timeline below to see significant marijuana legal and cultural events over time. The outdoor music festival Woodstock draws hundreds of thousands of music fans to New York. Marijuana permeates the festival. 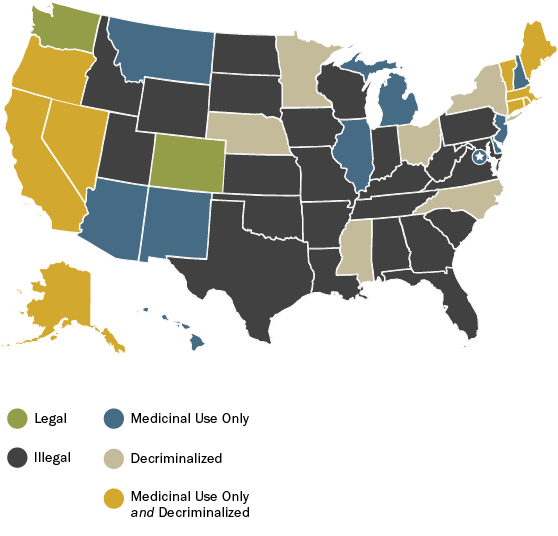 Controlled Substances Act lists marijuana as a Schedule I drug, a class of drugs that have a high potential for abuse and no accepted medical use. The National Commission on Marijuana and Drug Abuse (Shafer Commission) recommends marijuana be decriminalized for personal use, but President Nixon and Congress did not act. Oregon becomes the first state to decriminalize the possession of small amounts of marijuana. The chief of the Los Angeles Police Department establishes Drug Abuse Resistance Education (D.A.R.E.). Source: D.A.R.E. | Image: D.A.R.E. First Lady Nancy Reagan introduces and champions the “Just Say No” campaign. Judge Douglas Ginsburg withdraws from consideration as a Supreme Court justice after admitting he had used marijuana as a Harvard Law School professor. California voters pass Proposition 215, legalizing medical marijuana. Supreme Court rules that federal anti-drug laws do not permit an exception for medical marijuana. Supreme Court upholds the government’s ability to prohibit marijuana, even in states that have legalized it for medical use. California Proposition 19, which would have fully legalized marijuana, fails 54% to 46%. Colorado and Washington become the first states to legalize the sale and possession of marijuana for recreational use. Marijuana use is now legal in some form or decriminalized in 24 states and the District of Columbia. Pew Research Center has found growing public support for legalization over the past decade. Federal law prohibits the possession, selling or harvesting of marijuana. Decriminalization laws reduce the penalties associated with the use or possession of small amounts of marijuana.